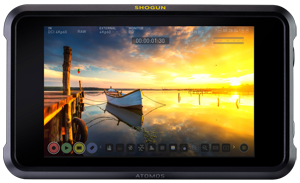 Shogun 7's portable size lets you monitor, analyze and tag while on set; and check how your content will look in your audience's home via real-time Dolby Vision output. With Shogun 7 you're not locked into any format, camera manufacturer or pipeline. It is a completely flexible master recording and production station. Monitor, record and switch between 4 live HD SDI video streams and one program stream for flexible in-the-field directing. Enjoy the freedom of asynchronous switching and gen lock in & out to connect to existing infrastructure. Shogun 7 offers up to HDp60 SDI ISOs x 4 recording. Once you've finished capturing your streams, just import the Atomos xml file into your NLE and your timeline populates with all your edits in place. Audio is also taken care of, with each ISO and program record, we insert the mixed analog stereo channels and embed 2 channels of digital audio in each recorded stream. The program stream always records the analog feed and switches between audio inputs for the on-camera audio to match the switched feed.